Motherhood can be a thankless job; sleepless nights, endless messes, ear splitting noise, constantly filled calendars, and drained checkbooks. When you lay it out like this, who would ever want children? But truthfully, motherhood has been the biggest blessing of my life. The list above pales in comparison to the countless ways my four children have enriched my life, caused me to grow, challenged my mind, made me laugh and drawn me closer to my husband. Watching them mature into intelligent, thoughtful, passionate young adults is probably the best time of all. Although I must admit I miss feeling a chubby, warm little hand in mine; or a little body curled up to me while reading a favorite story. I know the road of motherhood is filled with difficulties, challenges and worries. But I am here to tell you to be strong, stay the course, be the best parent you can be, invest in your child and his/her future, and make the time to revel in the simple joys of parenthood. If you do this, you and your family's future will be the richer for it. And remember to always count your blessings. Families Need to Work Together! Busy parents are the first to raise their hands for convenience. I know why--because it is difficult to keep up with crazy schedules and having multiple children in multiple schools with differing calendars, demands and expectations. Being able to cut a corner here and there has an immediate appeal. Ordering groceries from a delivery service like http://www.peapod.com can prove to be a true lifesaver. Making the choice to hire out for housecleaning or laundry services can offer parents a way to focus on being a better parent rather than stressing about chore lists that overwhelm and defeat them. But I also worry that we are sending the wrong message to our children if we "hire" out all of our responsibilities. These days I have seen parents hiring personal trainers to teach their kids to ride a bike. I see parents opening their wallets to have their houses decorated for the holidays. I know people who wouldn't dream of shopping and cooking a holiday meal. Aren't we really paying the ultimate price for all of this convenience? We are sacrificing time working together as a family to accomplish something, and this is a very important lesson. If our children never see us accomplish any sort of task, where is there work ethic going to come from? Please reflect on your lifestyle and see if embracing a simplified version might benefit you and your children. Let's all slow down a bit, and enjoy time working together to accomplish something. Decorate your own house, cook your own turkey, play with your own children. Get to know your family through these simple activities. Help one another. Laugh together. And get back to the basics of working and playing together. Your children will grow up so fast, don't miss out on the life experiences that bond you together. Give your children the gift of music! 1. Studying music teaches discipline. Children need to practice, and although they don't usually want to, they quickly understand that they won't improve without practice. 2. Music has relaxing qualities. And children in our fast paced world need to find ways to unplug and unwind. By studying music, children are exposed to different kinds of music and the benefits music can bring. 3. 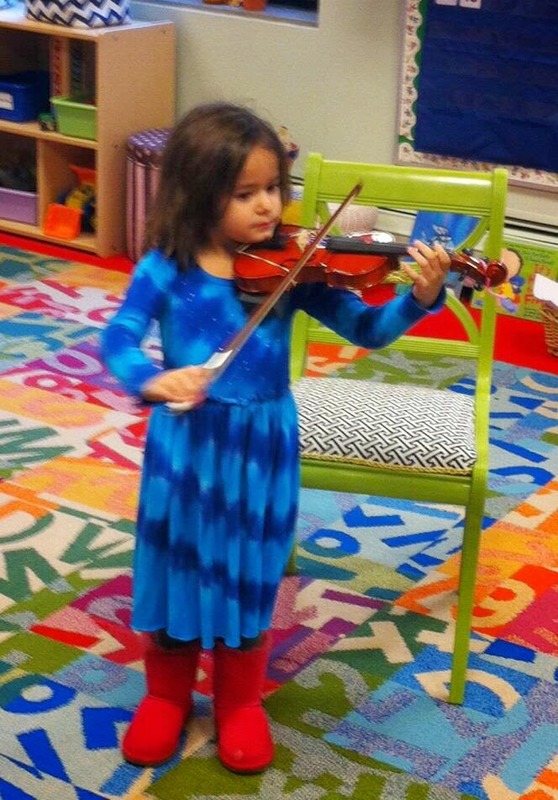 Learning an instrument can build self confidence. How do you know whether or not your child has musical talent unless you allow him/her to pursue music in some form? All children have gifts and music may be where your child's talent lies. In addition, learning to play an instrument brings a lot of positive feedback when your child performs for family and friends or in recitals or concerts. 4. Music allows for creativity. Children need creative outlets that allow them to experiment and test ideas. Real experiences of making music and performing music are so much more valuable to young minds than watching movies or playing video games. 5. Studying music has been linked to better performance/understanding of math concepts. It certainly cannot hurt to require your children to be using their brain power a little more each week. 6. Exposing your children to music will allow for you to connect with them about something. Children who study a musical instrument or take voice lessons are exposed to a wide variety of different types of music. There tastes will develop from there and will become a source of endless discussion as you to compare notes on musical tastes. My high school daughter loves to listen to George Winston piano music when she studies, my college age son has been featured on his college radio station-and loves to discover new, independent artists and their music. Another one of my daughters has introduced all to her love of country music, and finally my eldest daughter loves to attend gospel mass at a church in Washington D.C. All of these examples illustrate to me that we were on to something when we were insisting that they practice their instruments. I am so lucky to teach preschool and see these darling little people forming some of their very first friendships. Some children are tentative and shy, but after a few weeks of being together it is such a joy to see them "open themselves up" and become active seekers of new friends. Also I have had the opportunity to watch my own four children navigate the choppy waters of friendship during their middle school and high school years. Their relationships have been a constant reminder about how tricky friendships can be. So based on what I have observed through the countless numbers of friendships I have seen bud, blossom, and (if we are being honest) sometimes wither, I have come up with a list to help teach your child how to be a good friend. This is not always easy! But being a good friend helps your child understand what qualities to look for in friendships. And finding a good friend is truly a priceless blessing. 1. Friends Listen: A friendship cannot be one sided. If everything is about one person in the friendship than it is imbalanced and more of a groupie relationship than a friendship. Teach your child to listen to the viewpoints of their friends, and also have the confidence to speak their opinion on things. 2. Friends Defend: One of the most valuable aspects of a friendship is knowing that the other person "has your back". If you are unsure if your friend would defend you if they hear negative things about you, than you don't have a friend. And you are not a friend if you don't speak up and defend your friends against gossip and meanness. 3. Friends Share: My preschoolers will tell you about this all day long. They understand the concept of sharing but as children grow, it becomes less about sharing concrete items like toys and more about sharing their feelings with one another. If you are upset about something going on with your friend, you need to share the feelings and work it out. Friends also share the attention. It cannot always be about one person in the relationship. True friends value each other and share a balanced and healthy relationship. Good friends share happiness and sadness, together. If your friend has something good happen to them, you should celebrate with them. And conversely, if they are going through hard times, you need to be there for them. That is what true friends do. 4. Friends Forgive: No friendship is perfect. Friendships, just like real life have their ups and downs, peaks and valleys, joy and hurt. True friends learn how to talk things out, and forgive and move on. And the miracle is, the friendship will be stronger because of it. When you come through a difficult time with someone, it draws you closer. 5. Friends Don't Inflict Pain: If a friend is constantly making you feel upset, bad about yourself, or less than, it might be time to look for some new friends. Relationships don't always work out, and sadly knowing when to move on can be a very difficult decision to come to. Holding on to the hope that there are other people who are eagerly awaiting to become your friend, is something you need to know. 6. Be Your Own Best Friend: Liking yourself is important. Knowing who you are and what you stand for will allow you to find friends that compliment you and enrich your life. Trying to be someone or something that you are not, by being friends with someone just to be "cool" is never a good idea. People who like themselves have more authentic relationships because they are not based on trying to prove something to others. These lessons are important but take a long time to learn. Discuss these issues with your children and help to coach them along their path to develop and keep long lasting and valuable friendships.